Authentic 14k rose gold, white gold, and yellow gold are expertly weaved with a white gold beveled edge. Also available with a yellow band or rose gold band, 18k gold, or platinum by request. 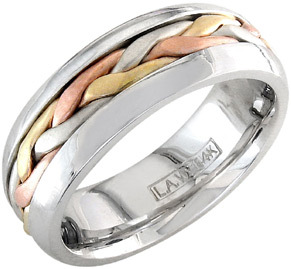 We guarantee our 14K Tri-Color Gold Braided Wedding Band to be high quality, authentic jewelry, as described above.